There are more than 330 freshwater lakes within the City of Sudbury, and we are committed to maintaining the quality of the water in and around our operations. Every chance we get, we identify and seize opportunities to reuse and recycle process water to reduce what we draw from the natural environment. In Sudbury, the ore milling process calls for the highest amount of water usage, so we currently draw almost all of this water from reuse and recycle streams associated with our Copper Cliff surface operations. Any excess water is treated in our integrated water management system, and discharged safely back into the environment. Wastewater generated through our operations, as well as surface runoff from Vale properties, are thoroughly treated through a process of metal precipitation and pH adjustment prior to discharge into the natural environment. Our treatment systems are operated in compliance with federal and provincial regulations, permits and approvals, with effluents monitored regularly by an Environmental Effects Monitoring program regulated by Environment Canada. We use water to generate about 15% of all the power required to run our Sudbury Operations, using four generating stations and 11 dam structures on the Spanish River system, plus a generating station on the Vermilion River. 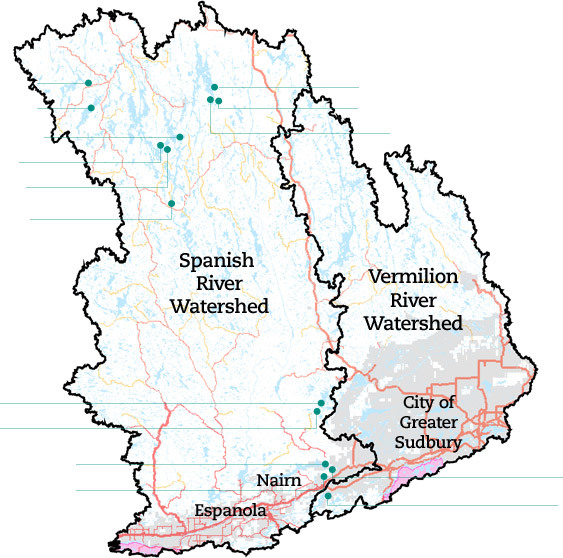 The Spanish River Water Management Plan was first developed in 1993 using a multi-stakeholder process, and facilitated by the Ministry of Natural Resources. The plan, currently being updated, aims to balance ecological, recreational, community and economic interests in years with low, normal or high precipitation. Click on the map below for more information about Vale’s power dams, reservoirs and water elevations resulting from the latest round of multi-stakeholder consultations. Dam #3 is located in Biscotasi Township (47.3412N, 81.9942W) on the eastern shore of the Biscotasi Lake. It works in conjunction with Biscotasi Dam No.1 and Dam No.2 to control lake levels. Like Dam #2 it is primarily a flood control structure. The dam was originally constructed in 1887 as a timber crib structure. It was reconstructed in 1936 as an earthen dam with a concrete sluiceway that contains up to 5 removable stop logs. The sill elevation is 1319.40 ft (402.15 m). This is one of three dams on Biscotasi Lake, which is located at the northern end of the west branch of the Spanish River in Lillie Township (47.2947N, 81.9996W). Biscotasi Lake receives water from Ramsey Lake (Chapleau District), Indian Lake, Mozhabong Lake, Canoe (Bardney) Lake, and Frechette Lake. Dam No.1 is the main level controlling dam and works in conjunction with Dam No.2 and Dam No.3, which act as flood control structures. The drainage area of the lake is approximately 567.21 km2 (219 mi2) with a surface area of approximately 60 km2 (23 mi2). The lake is used as a reservoir, with the control structures covered under MNR License of Occupation #8802. Dam No.1 is a concrete gravity structure, originally built in 1917 and upgraded in the 1950’s. It was preceded by a timber crib structure that was built in 1887. 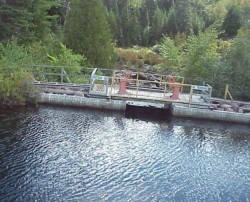 The dam has two sluiceways, each containing up to 14 removable stop logs. The sill elevation is 1310.08 ft geodetic (399.31 m). The lake level is presently maintained using the cumulative rule curve from the 1993 Upper Spanish River Water Management Plan. Level control varies between 7.5 and 16 ft (2.29 – 4.88 m) above sill. 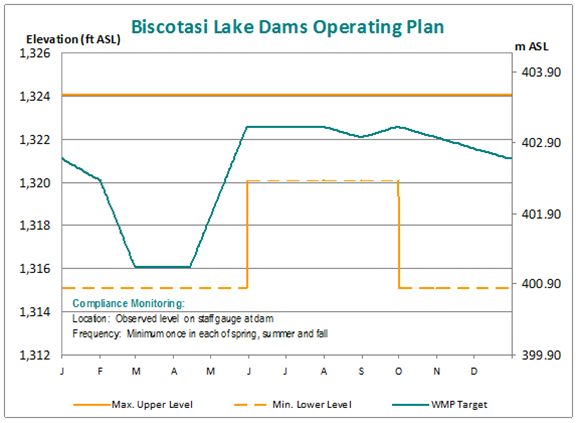 Under normal conditions Biscotasi Lake will remain at full supply level from the end of May until the end of September. Drawdown begins in October and is discontinued in February. Biscotasi Lake has been designated a provincial park and addition area. Passing through it is the Mississagi (Biscotasi) Canoe Loop. The central wetland complex has been identified as being provincially significant. The small community of Biscotasing, accessible by secondary resource roads, is located beside the lake, which is home to a few tourist outfitters and cottages. Fishing pressure is intensive, with whitefish, walleye and northern pike dominating. Dam No.2 is located approximately 200 yards east of Biscotasi Dam No.1 in Lillie Township (47.2943N, 82.0008W). It works in conjunction with Dam No.1 and Dam No.3 to control lake levels and acts primarily as a flood control structure. The dam was originally constructed using timber cribbing in 1886 and then replaced in 1936 as an earthen dam with a concrete sluiceway containing up to 8 removable stop logs. The sill elevation is 1316.97 ft (401.41 m). High Falls No.1 generating plant and dams are located in Hyman Township (46.3798N, 81.5707W, Concession No. 01, Lot No. 01), approximately ¾ of a mile down stream of the Big Eddy dam and generating plant, and are covered under the same MNR Waterpower Lease Agreement #162. This facility was constructed in 1905. The tailrace of the Big Eddy plant is the fore bay of High Falls No.1 and No.2 plants. High Falls No.1 generating plant works in conjunction with High Falls No. 2 plant and the Big Eddy generating plant and is known as a ‘cascade system’. 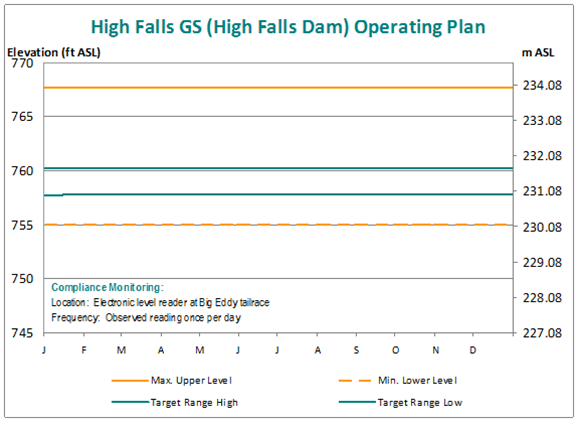 High Falls No.1 and No.2 plants will use the water that passes through Big Eddy plant/dam. If the flow from the Big Eddy plant/dam is greater than what High Falls No.1 and No.2 plants can use the water will by-pass the plants via the spill way. The normal operating limits of the High Falls No.1 and No.2 plants forebay are between 230.96 m (757.74 ft) and 231.72 m (760.24 ft) geodetic. 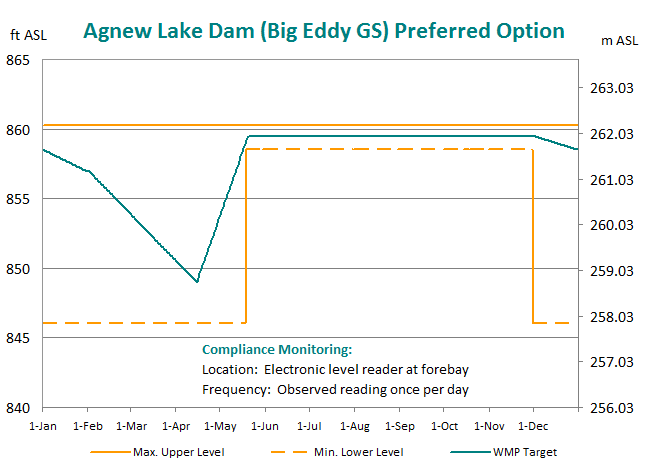 The forebay level for High Falls No.1 and No.2 plants is constantly monitored to ensure the tailrace level at Big Eddy is within operating parameters. The High Falls No.1 plant dams and intake structure consist of two dams, one spillway and one intake structure. The two dams and spillway are shared with High Falls No.2 plant. The East dam is a concrete gravity type water retaining dam 198.12 m (650 ft) long. The North dam is a concrete gravity type water retaining dam 27.43 m (90 ft) long. The spillway (West dam) is a concrete ‘ogee’ type gravity dam 204.22 m (670 ft) long. 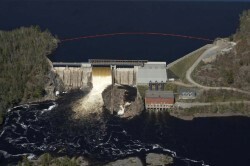 The intake structure is adjacent to High Falls No.2 plant and consists of a concrete gravity type dam, a gatehouse of steel and wood construction, four intake gates with screw drives, and four – nine foot diameter steel riveted penstocks – 82.3 m (270 ft) long. The Wabageshik (also know as Lorne Falls) generating plant and dam are located in Lorne Township (46.3156N, 81.5212W, Concession No. 03, Lot No. 08),on the Vermilion River, near the outlet of Ella Lake. 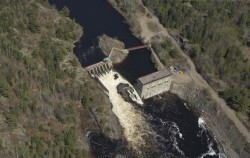 The facility was constructed in 1909 and is covered under MNR Waterpower Lease Agreement #164. The Wabageshik generating plant is a ‘run of the river facility’; this meaning that there is very little storage capacity in the forebay area. 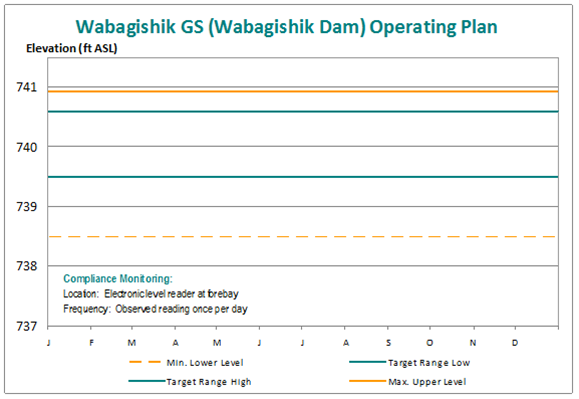 The normal operating limits of the Wabageshik plant forebay are between 225.40 m (739.50 ft) and 225.73 m (740.60 ft) geodetic. The dam is a concrete gravity type structure 220.98 m (725 ft) in length. The spillway consists of a single motorized gate, which is 12.19 m (40 ft) in length and 7.31 m (24 ft) in height. There are also 4 stop log sluiceways, which may contain up to 10 stop logs each. The intake structure consists of 2 motorized head gates (1 per penstock) and 2 riveted steel penstocks, which are 2.44 m (8 ft) in diameter and 128.01 m (420 ft) in length. Nairn Falls generating plant and dam are located on the Spanish River in Nairn Township (46.3444N, 81.5733W, Concession No. 05, Lot No. 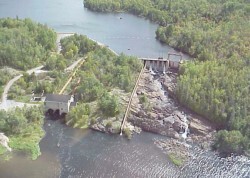 01), approximately seven miles (11.26 km) downstream of the High Falls No.1 and No.2 generating plants, and are covered under MNR Waterpower Lease Agreement #163. The facility was constructed in 1915. Nairn Falls generating plant works in conjunction with High Falls No.1 and No.2 plants and the Big Eddy generating plant as a ‘cascade system’. Nairn Falls will use the water that passes through Big Eddy plant/dam and High Falls No.1 and No.2 generating dams/plants. If the flow from upstream is greater than what Nairn Falls can use the water will by-pass the plant via the spillway. The Nairn Falls powerhouse’s 39.01 m (128 ft) upstream wall acts as a dam complete with intakes structures for three concrete penstocks and spiral casing. The main spill way is of the concrete gravity type construction. It is 30.48 m (100 ft) long, 10.67 m (35 ft) high and contains seven stop log sluiceways. The sluiceways contain varying numbers of stop logs. No.1 sluiceway may contain up to six stop logs, No. 2 sluiceway may contain up to 7 stop logs, No. 3 through No. 7 sluiceways may contain up to 8 stop logs each. There is a fixed overflow spillway adjacent to the powerhouse. This spillway is 44.2 m (145 ft) long and 5 ft high. A 2-foot inflatable rubber dam was installed on this spillway in 1995. 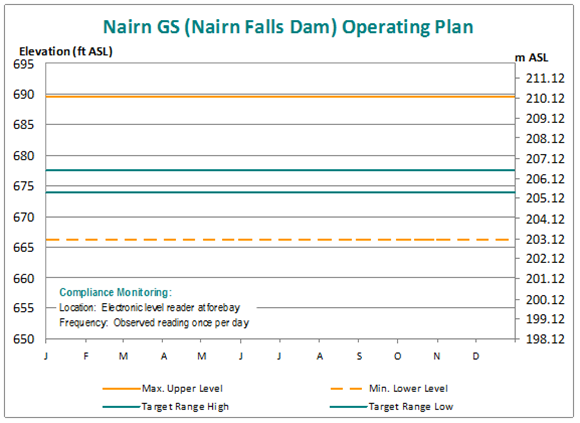 The normal operating limits of the Nairn Falls plant forebay are between 205.40 m (673.90 ft) and 206.01 (675.90 ft) geodetic. 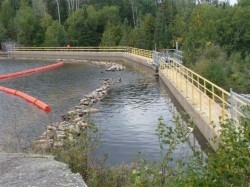 The Big Eddy dam is located at the eastern outlet of Agnew Lake in Hyman Township (46.3851N, 81.5789W, Concession No. 02, Lot No. 02) and is operated under MNR Waterpower Lease Agreement #162. In 1920, the dam was built and Agnew Lake created as the head pond for the Big Eddy powerhouse, which was built in 1924-1928. Agnew Lake has a surface area of 2285.41 km2 (882.4 mi2). Currently, the dam is a concrete gravity type structure. It is 353.57 m (1,160 ft) in length and 44.50 m (146 ft) high. The spillway consists of 2 Bridgestone rubber dams each 22.86 m (75 ft) in length and 3.05 m (10 ft) in diameter. There are also two Obermeyer dams, each 30.48m (100 ft) in length and 3.05 m (10 ft) high. The spillway capacity is presently 1203.47 m3/s (42,500 cfs ). The headwater elevation is 261.98 m (859.50 ft); the tailrace water elevation is 231.65 m (760.00 ft), giving a gross head of 30.33 m (99.50 ft). The intake structure consists of a gatehouse, 6 head gates (2 per penstock) and 3 riveted steel penstocks, which are 3.66 m (12 ft) in diameter and 91.44 m (300 ft) long. The lake level, throughout the year, is presently maintained by following the cumulative rule curve from the 1993 Upper Spanish River Water Management. Under normal conditions Agnew Lake will remain at full supply level from the end of May until mid November. Drawdown begins in December and ends April 15. 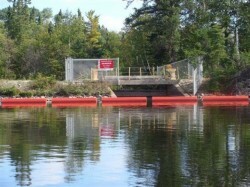 This dam, operated under MNR License of Occupation #1517, is located in Totten Township (46.5349N, 81.5947W) approximately 0.8 km (½ mi) south of Ministic Lake. The Armstrong lake drainage area is approximately 19 km2 (7.5 mi2), flowing into John’s Creek and Lake Agnew. The lake itself has a surface area of 1.5 km2 (0.6 mi2). The original dam was constructed, prior to 1918, by loggers who subsequently sold it to a Vale predecessor company. The dam construction is the timber crib rock filled type. It was reconstructed in 1964 and has one sluiceway containing up to nine removable stop logs. The sill elevation is 1152.11 ft geodetic (351.16 m). The lake level is presently maintained using the cumulative rule curve from the 1993 Upper Spanish River Water Management Plan. Control varies between 4 and 7 ft (1.22 – 2.13 m) above sill. 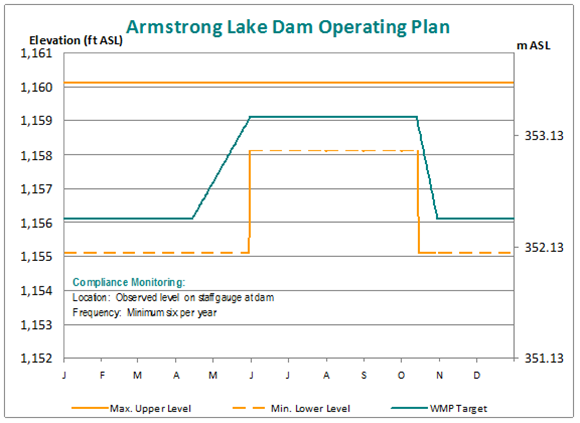 Under normal conditions Armstrong Lake will remain at full supply level from the end of May until mid October. Drawdown begins in October and is discontinued in October. There are approximately 25 cottages on the lake, whose resident fish species include whitefish, smallmouth bass, yellow perch and walleye. Lake trout stocking has occurred in this lake, although it is unknown if the species was originally present. This dam, operated under MNR License of Occupation #1517, is located in Cascaden Township (46.5476N, 81.5678W), at the south end of Ministic Lake. The drainage area is approximately 47 km2 (18.4 mi2) and it flows southward into Armstrong Lake. Ministic Lake has a surface area of 6 km2 (2.2 mi2). The original dam was constructed, prior to 1918, by loggers who subsequently sold it to a Vale predecessor company. 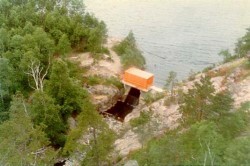 The current dam is a concrete structure, constructed in 1964, with one sluiceway containing up to 12 removable stop logs. Sill elevation is 1201.0 ft geodetic (366.06 m). The lake level is presently maintained by following the cumulative rule curve from the 1993 Upper Spanish River Water Management. Level control varies between 4 and 6 ft (1.22 – 1.83 m) above sill. 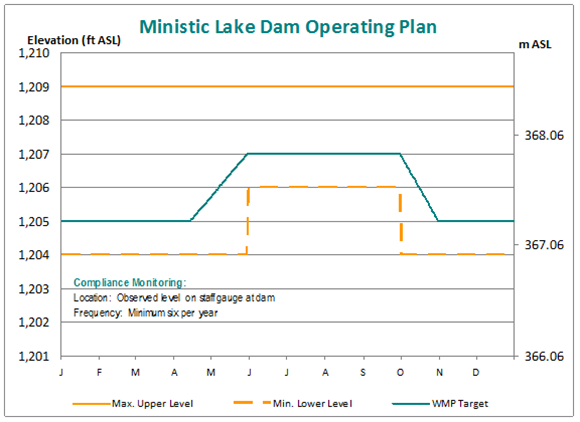 Under normal conditions Ministic Lake will remain at full supply level from the end of May until mid October. Drawdown begins in October and is discontinued in October. 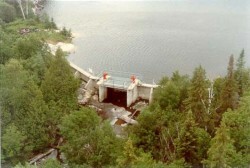 This dam, operated under MNR License of Occupation #8802, is located at the north end of Mozhabong Lake in Jasper Township (47.0363N, 82.1387W). Mozhabong Lake flows north into Indian Lake, which flows north into Biscotasi Lake. The drainage area of the lake is approximately 163.17 km2 (63 mi2) with a surface area of approximately 23.31 km2 (9 mi2). The lake is used as a reservoir. The dam, originally constructed in the early 1900’s and reconstructed in 1945, is a combination of earth-rock fill with an abutting concrete sluiceway containing up to 10 removable stop logs. The sill elevation is 1341.25 ft geodetic (408.81 m). 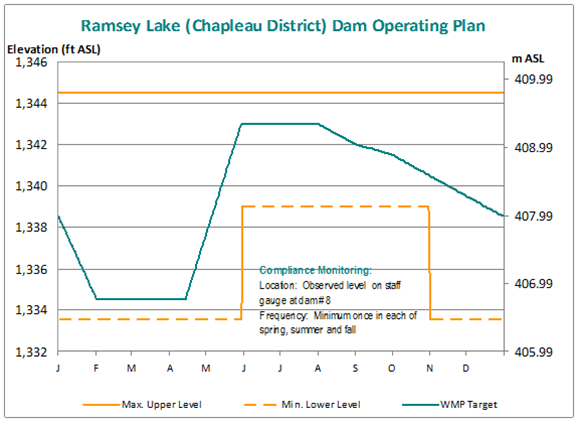 The lake level maintained using the cumulative rule curve from the 1993 Upper Spanish River Water Management Plan. Lake level is controlled between 5 and 9 ft (1.52 – 2.74 m) above sill. 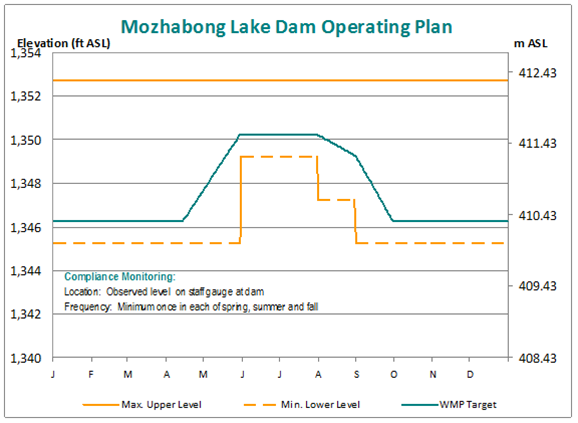 Under normal conditions Mozhabong Lake will remain at full supply level from the end of May until the end of July. 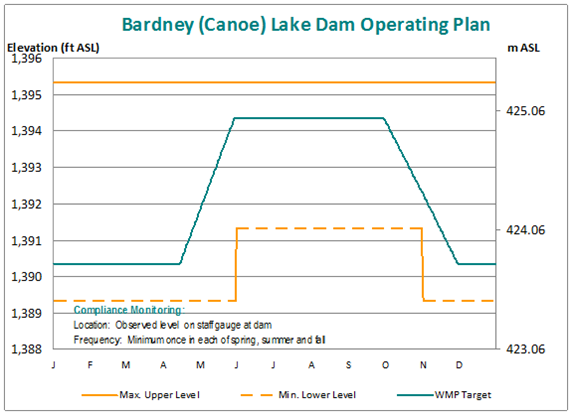 Drawdown begins in August and is discontinued when the lake obtains a level of 5 ft (1.52 m) above the dam sill or September 30th which ever comes first. Mozhabong Lake has been designated a Conservation Reserve. It currently has restricted access via a gated resource road. Species occurring in the lake include lake trout, whitefish, northern pike, smallmouth bass and yellow perch. This is the main control dam on Ramsey Lake in McPhail Township (47.1840N, 82.1682W) and is operated under MNR License of Occupation #8802. Ramsey Lake is the largest of the Upper Spanish lakes with a drainage area of approximately 989.38 km2 (382 mi2) and a surface area of approximately 62 km2 (24 mi2). The lake is used as a reservoir. The dam is located on the southeast side of the lake and discharges flow into Biscotasi Lake. The original dam construction occurred in the early 1900’s and the dam was reconstructed in 1945. It is a combination of earth-rock and a central sluiceway portion of reinforced concrete with buttressing. It has three sluiceways, two sluiceways may contain up to 16 stop logs each, and the remaining sluiceway may contain up to 12 stop logs. The sill elevation is 1327.0 ft. geodetic (404.47 m). The lake level is presently maintained using the cumulative rule curve from the 1993 Upper Spanish River Water Management Plan. Under normal conditions elevation varies from 7.5 to 16 ft (2.29 – 4.88 m) above sill, although this has been restricted to 15 ft (4.57 m) pending dam upgrades. Under normal conditions Ramsey Lake will remain at full supply level from the end of May until the end of July. Drawdown begins in August and is discontinued by the end of January. Ramsey Lake is part of the Mississagi River Provincial Park and additions, and is included as part of the Mississagi to Aubrey Falls Canoe Route. Development on the lake is limited, with access provided by air or resource road, but fishing pressure is heavy. Species include northern pike, walleye, white sucker and yellow perch. 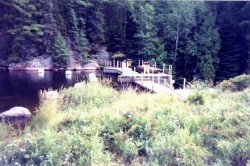 This dam is one of two located on Ramsey Lake in McPhail Township (47.1894N, 82.1861W). It’s main purpose is flood control. Ramsey Lake is the largest of the Upper Spanish lakes with a drainage area of approximately 989.38 km2 (382 mi2) and a surface area of approximately 62 km2 (24 mi2). The lake is used as a reservoir. The dam was originally constructed in the early 1900’s and reconstructed in 1928. It is a 452 ft long concrete gravity structure with a single sluiceway containing up to 12 removable stop logs. The sill elevation is 1327.0 ft geodetic (404.47 m). 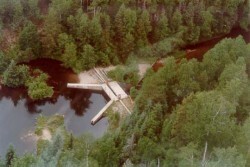 This dam, operated under MNR License of Occupation #8802, is located at the northern outlet of Indian Lake in McPhail Township (47.2126N, 82.1089W). Indian Lake flows north, via the Indian River, into Biscotasi Lake. The drainage area of the lake is approximately 168.35 km2 (65 mi2) with a surface area of approximately 14 km2 (5.5 mi2). The lake is used as a reservoir. The dam is a gravity type concrete structure, originally built in 1919 as a timber crib structure, and reconstructed in 1952. It has one sluiceway containing up to 9 removable stop logs. The sill elevation is 1334.26 ft geodetic (406.68 m). The lake level is presently maintained using the cumulative rule curve from the 1993 Upper Spanish River Water Management Plan. Control levels vary between 4 and 9 ft (1.22 – 2.74 m) above sill. 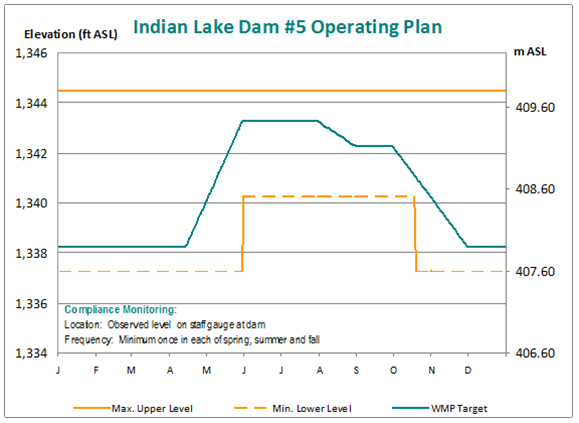 Under normal conditions Indian Lake will remain at full supply level from the end of May until the end of July. Drawdown begins in August and is discontinued in November. Development on the lake is minimal, with access via air or resource road. Fish species present include walleye, northern pike, whitefish and yellow perch. The Canoe Lake dam, operated under MNR License of Occupation #8802, is located at the northeast end of the lake in Abney Township (47.2887N, 82.4488W). Canoe Lake is the smallest of the Upper Spanish Lakes with a surface area of 9.0 km2 (3.5 mi2) and a drainage area of 77.70 km2 (30 mi2). The lake is used as a reservoir. It flows into Spanish Lake and then into Ramsey (Chapleau) Lake. 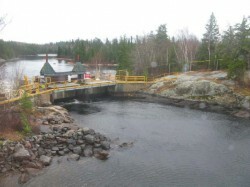 The Canoe Lake dam was originally constructed in the early 1900’s, replaced in 1952 and 1958 and reconstructed in 1978. It is composed of buttress-walled concrete with a single log sluiceway containing up to 10 removable stop logs. The sill elevation is at 1386.33 ft geodetic (422.55 m). The lake level is presently maintained using the cumulative rule curve from the 1993 Upper Spanish River Water Management Plan. Control levels vary between 4 and 8 ft (1.22 – 2.44 m) above sill. Under normal conditions, Canoe Lake will remain at full supply level from the end of May until the end of September. Drawdown begins in October and ends in November. There is no development on the lake, which is accessible by air or by resource roads. The lake is a part of Mississagi River Provincial Park and the Mississagi to Aubrey Falls Canoe Route. It supports whitefish, northern pike, walleye and yellow perch. 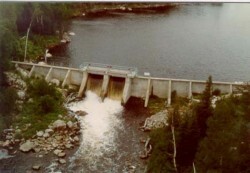 The Frechette Lake dam, operated under MNR License of Occupation #8802, is located in Faust Township (47.3404N, 82.4744W), in the far northwestern corner of the Spanish River watershed. Frechette Lake is approximately 21km2 (8 mi2) in size with a watershed drainage area of 277.13 km2 (107 mi2). The lake is used as a reservoir. Frechette Lake drains via the Spanish River into Spanish Lake, which then drains into Ramsey Lake (Chapleau District). 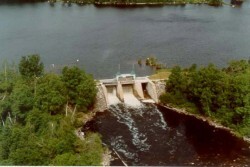 The original Frechette Lake dam was constructed in the early 1900’s. It was reconstructed in 1979 and retrofitted in 1994. Currently, it is a buttress-walled concrete structure, having a double sluiceway with each containing up to 12 removable stoplogs. The sill elevation is at 1384.79 ft geodetic (422.08 m). The lake level is presently maintained using the cumulative rule curve from the 1993 Upper Spanish River Water Management Plan. Control levels vary between 4 ft (1.22 m) and 13 ft (3.96m) above sill. 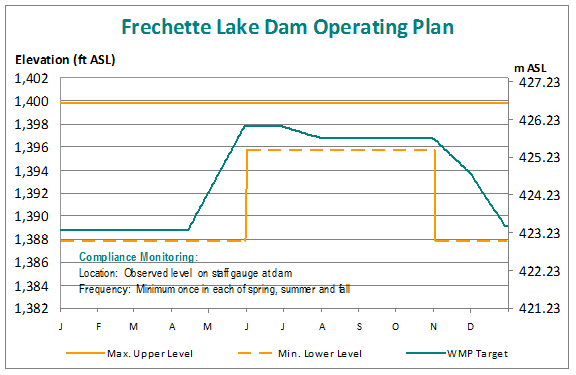 Under normal conditions Frechette Lake will remain at full supply level from the end of May until the end of October. Drawdown begins in November and ends in December. Frechette Lake is a remote tourism lake with minimal development. It is accessible by air or seasonal resource roads where 4-wheel drive vehicles are required. The lake supports coldwater fish species lake trout and whitefish, as well as the cool-water species northern pike. As much as a quarter of Greater Sudbury’s water supply initially comes from our Vermilion Water Treatment Plant, which also supplies the water needed for our mining, milling, smelting and refining operations in Copper Cliff. Vale’s Vermillion Water Treatment Plant also provides clean drinking water to over 10,000 local residents in communities of Lively, Naughton and Atikameksheng Anishnawbek First Nation. Vale is committed to providing safe drinking water to the City of greater Sudbury municipal drinking water distribution system, in accordance with all applicable legislative and regulatory requirements, as well as management and continual improvement of a Quality Management System. Vale is also an Accredited Operating Authority under the Ministry of Environment and Climate Change’s Verification Audit Program. We know that water is one of the earth’s most valuable resources for personal, domestic and industrial uses. So in 2008, we proudly contributed $4.5 million to the construction of the $20-million Vale Living with Lakes Centre at Laurentian University in Sudbury, a global centre of excellence in freshwater ecology, environmental restoration and sustainability. It’s one of the most environmentally advanced buildings in Canada, using geothermal energy and recycling rainwater. Research conducted at the centre helps measure the effectiveness of environmental protection work to protect our waterways, now and in the future.